This book is divided into two sections: Getting started, and Directory of stitches. The book begins with Getting Started, a chapter packed with information on crocheting basics, from choosing yarn and holding your hook, to working basics stitches, stitch formations and measuring tension. Once you have mastered the basics, it’s time to move onto the second chapter, the Directory of Stitches and start learning to work a huge variety of crochet stitches. This chapter will walk you through the essential of crocheting. Basics stitches and useful techniques are covered with step-by-step instructions and illustrated with clear line drawings. 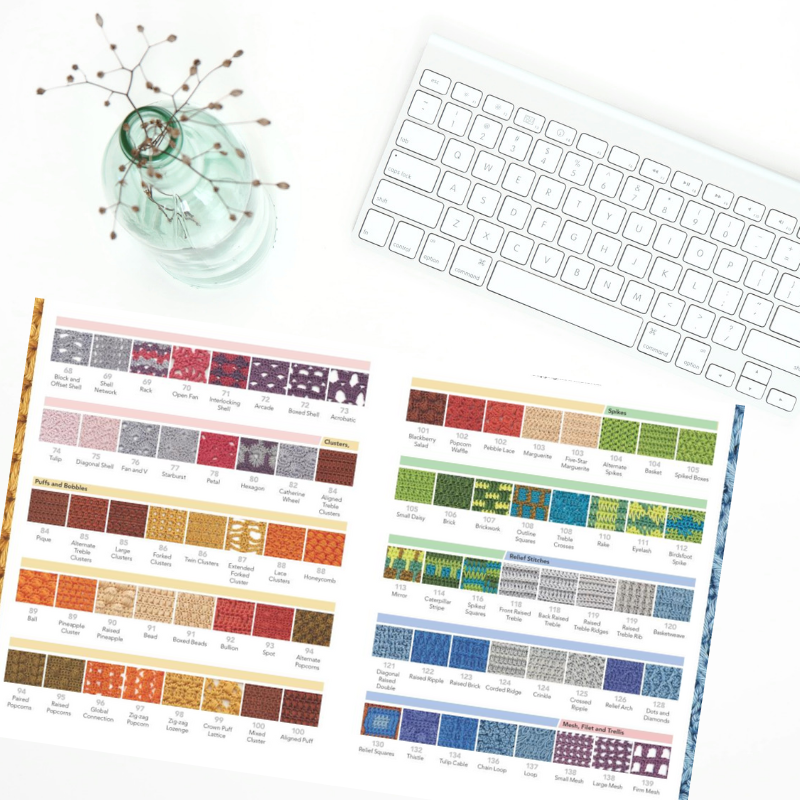 In the second chapter you will find 200 different crochet stitches, divided into 9 families to help you to easily find the perfect one to suit your project. 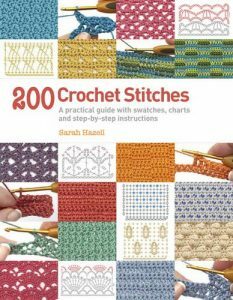 200 Crochet Stitches is a practical guide with actual-size swatches, charts, and instructions and is designed to get crochet fans discovering new stitches and creative ways of working crochet. It contains a wealth of stitch patterns and how-to techniques. The 200 crochet stitches are divided into 9 groups of different colours, which makes it easy to find them. 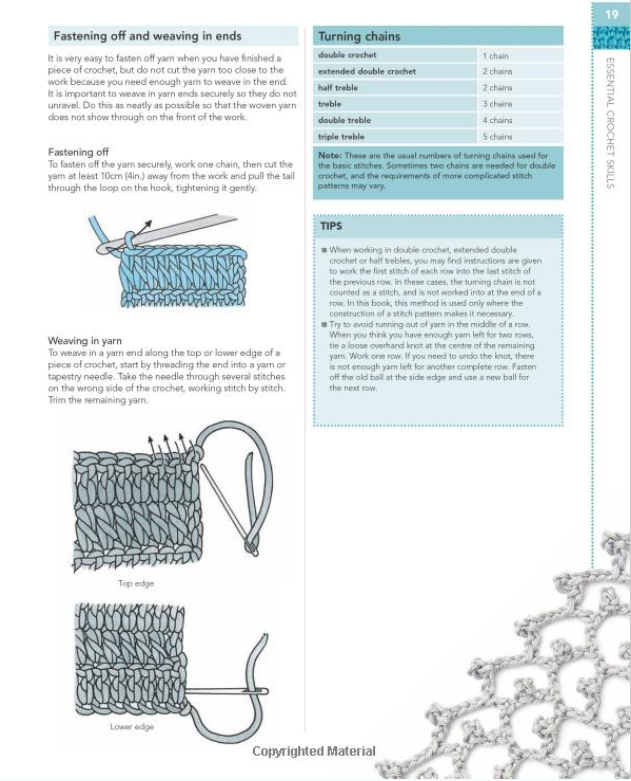 Stitches are introduced accompanied by clear photographic step-by-step instructions and crochet diagrams. 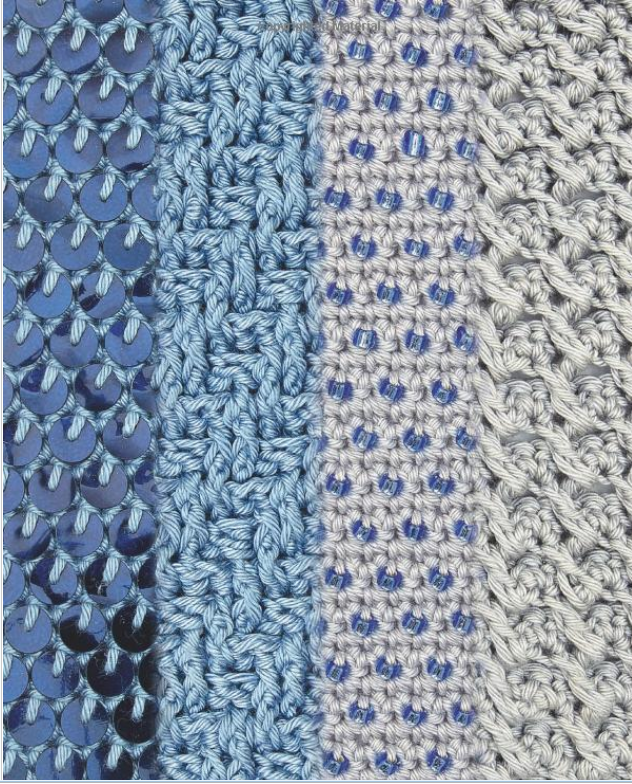 You can learn how to build a sturdy and hard-wearing fabric from double crochet stitches, create a fun, multi-coloured pattern of spikes or chevrons, make a beautiful and delicate filet fabric or embellish your pieces with bobbles, pop-corns or sequins. 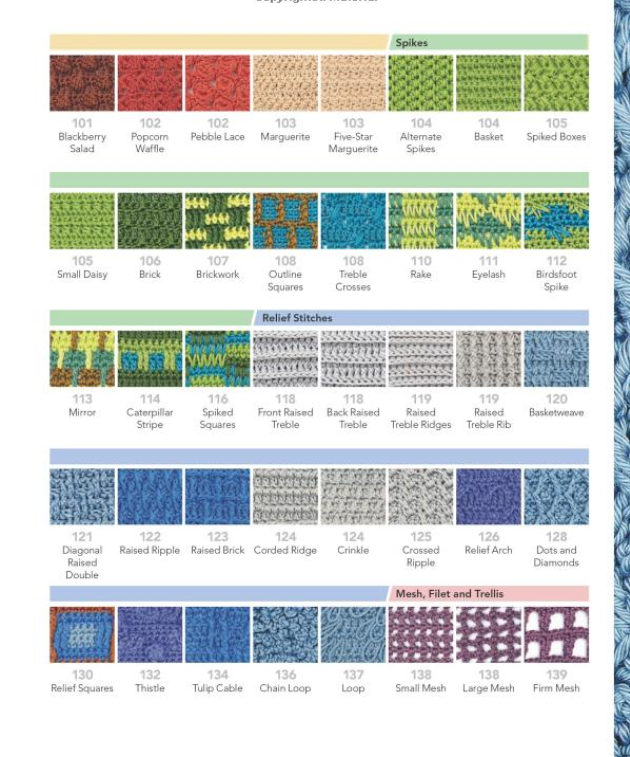 What I like most about this book is that it includes crochet diagrams and more than 350 beautiful photos and images. 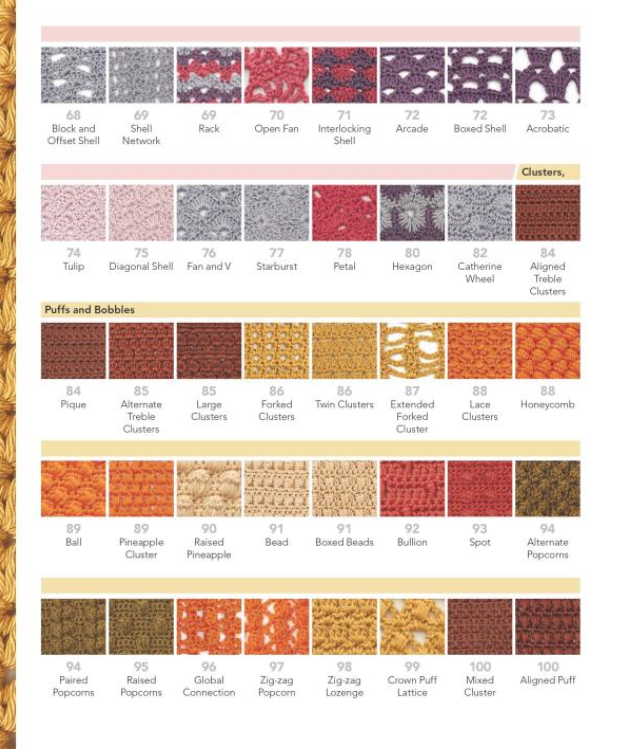 And that the 200 stitches are divided into different categories, which is very useful. 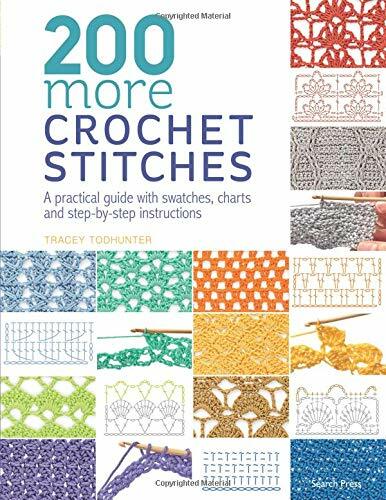 The best of all is that this book has a second part, 200 more crochet stitches and together there are 400 crochet stitches, sorted, classified and explained! To be honest, this is an excellent book and you must have it if you really love crochet.